I met up with Todd at CS Lee around 9:30. The weather was cold, with air temps around 43 when we arrived, and a 5-10mph wind that provided a wind chill that cut through you, particularly when wading in 48 degree water. My original plan was to check out the bridge, hit the creek mouths on the way down to the Econ, and then potentially head up to Culpepper bend to do some scouting. I decided to start shallow with the single hand fly rod and a light weighted fly, thinking the shad would potentially be looking for warmer water. Based on the gauge height of just under 4 feet and a quick look by the bridge, we determined the water was still a little high to wade around the bridge. It could be done, but figured we would be in thigh to waist high water at times, and with the cold temps, we decided to skip it. As we passed, we noticed a couple guys fishing near the bridge from a gheenoe. A message from Suede confirmed that it was them fishing, and that they did find shad near the junction. We worked the creek mouths for an hour or two, me working shallow with the single hander, and Todd swinging deep with switch rod. Todd noticed a fish shallow, right in an area of convergence where there was a nice eddy, and some odd current upstream of it, likely caused by the wind and water coming off of the pasture. After a couple of casts with a 7.5ft T8/ 2.5 Ft Intermediate tip, Todd was the first to hook up with a nice American shad using a size 2 Gold-@ss Gotcha with a tan wing. The fish made several good jumps and a decent run before coming unhooked. Todd graciously yielded the spot to me as he thought I would be better off fishing the single hand rod shallow in that particular area due to the backward current. I worked the area using a beadchain Crazy Charlie but found no takers. Todd promptly hooked up with a Hickory (pictured) quite literally 5 feet from me which was hugging the bank. The fishing was slow, so we decided to join the masses up by the Econ. When we arrived, there were two or three boats working the channel, and at one point I counted six. We were surprised there were as many people out fishing for shad this early in the season on such a cold day. 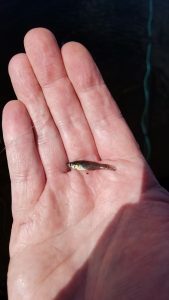 We wondered if it had anything to do with this strange guy that is compelled to blog about his adventures in fishing for, and sometimes catching said shad. 🙂 Who knows? But I say the more the merrier, there is plenty of river to explore if you get tired of the crowds. We fished the west bank, which is comfortably wadable with gauge heights under 4 feet and did not find fish. In fact, we never saw anyone catch any fish, even the boats. The west bank has been spotty in the last few years. It used to be a great place to hang all day, working your way up the Econ a couple of turns, but honestly, it is starting to get to the point I am not sure it even warrants a stop. The east bank seems to produce better in years of late, but the water is still too high to comfortably wade there. Gauge heights of under 3 feet are much preferred but be aware, high weeds can make false casting tough depending on wind. Single hand Spey casting, or Skagit/ Spey with a long rod is my preference. That said, it seemed the fish were further downriver today. With the slow fishing we decided to head up to Culpepper bend. We motored up with the trolling motor in about 25 minutes and found no current. We worked the turn upstream of Culpepper for about 20 minutes and decided to head back. The deep cycle battery pooped out about a turn from the mouth of the Econ on the way back, so we resorted back to paddles and made our way back down to the creek mouths. We fished for another hour or so before calling it a day around 4:00. It was a fun day, despite the cold. I will likely skip going out next weekend and wait for the run to thicken up a bit before heading back out. The Fry Fly is an easy to tie, small, lightweight minnow pattern that is a great match when fish are gorging themselves on mosquitofish in the St. Johns River. Shad can often be caught on this pattern when they are active in the upper part of the water column. 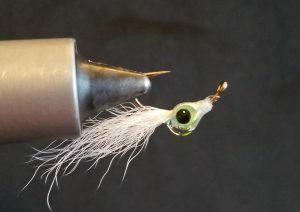 The pattern does not have a bead chain or hourglass eye, but rather has a small tear drop shaped epoxy head that allows the hook to ride tip up, but also stay shallow rather than diving to the bottom. The shape of the head also creates a darting action when being retrieved that can elicit a strike. In addition to shad, you will find bass, stripers/ hybrids, pan fish, and even gar will take these little flies, so they are a great alternate fly to keep in your box. 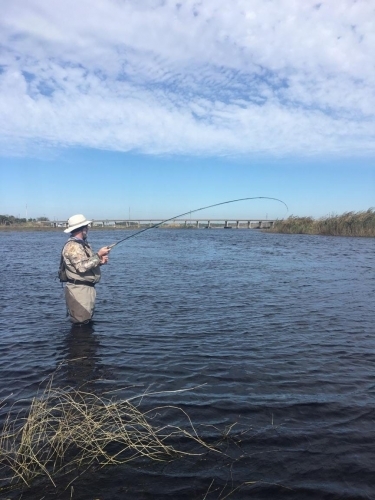 The Fry Fly may not be a fly that you use on every outing, but when fish are active up top, they can be deadly, particularly in the early part of the season as the water recedes off of the pastures and in to the river’s banks. 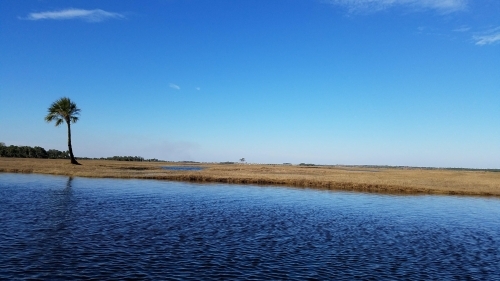 This concentrates the small Gambusia (Mosquito Fish,) grass shrimp, and other tasty morsels in to the river that have otherwise been spread out across the flat pasture. Fish of all kinds school up and the feeding frenzy can be amazing to fish. 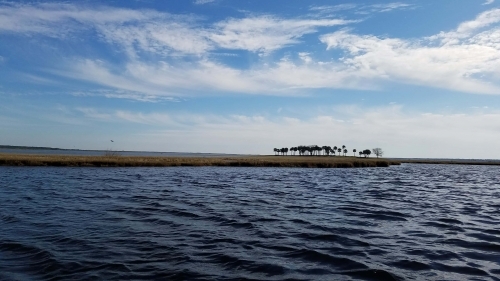 The Shad Buster is a fly pattern that I had seen in pictures and learned to tie, but I never really figured out what it was called until I stumbled across an old article that Steve Gardner wrote. 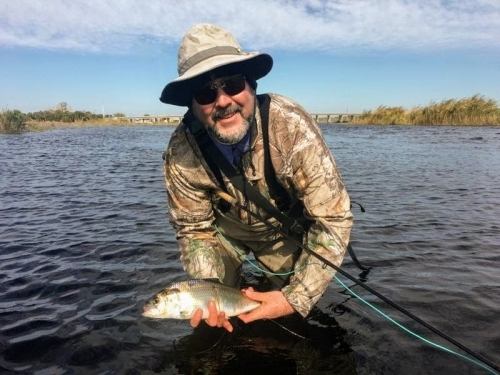 Steve is a long time fly fisherman, ex-professional fly tier, and he frequents the St. Johns River in pursuit of shad where he uses this fly. The Shad Buster is a hackle fly, but unlike other hackled shad flies like the Shad Intruder and the Shad Comet, it uses a stiffer “spade” feather for the palmered collar. These types of feathers are typically used for tails on dry flies, and although the barbs have a webby base, the barb itself is stiff. 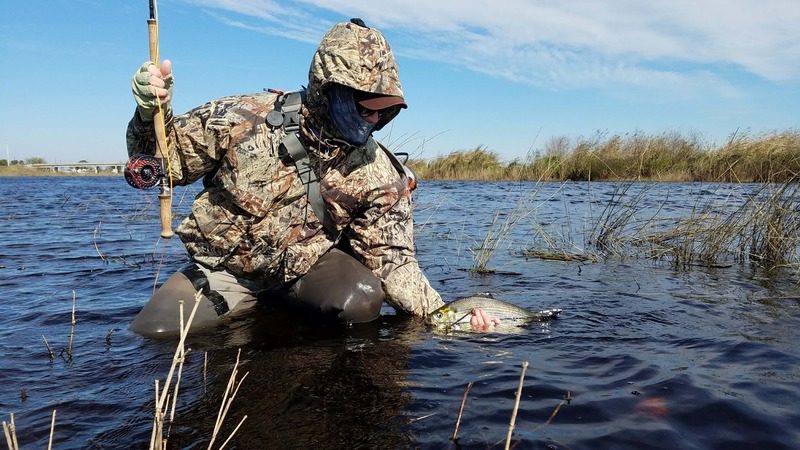 While true spade feathers come from the shoulders and wings of the rooster, you can usually find suitable feathers at the outside of the top of a dry fly neck. Another difference between the Shad Buster and other types of hackled shad flies is the fact that the hackle is wrapped in FRONT of the eyes which causes the barbs to align in the gap between the two eyes themselves. This gives the fly a more triangular or arrow shaped profile rather than the rounded three dimensional umbrella shape of a soft hackle. The Shad Comet is a fly I learned to tie after studying an image I found on a Google Image search several years ago when researching shad flies. I could never find instructions but was able to piece together the pattern based on what I saw in the image. This fly became one of my standard alternates and has been a fixture in my fly box since I first started targeting shad on the St. Johns River. When I first started tying this shad fly, I liked the way the fly looked, but found the process of tying hackle style flies tedious. I found hair wing flies like the Kip Tailed Clouser, Shad Dart, and Crazy Charlie much easier to tie and I gravitated towards them when tying up dozens of flies for the season. Because of this, hair wing type patterns became my defacto choice when targeting shad by no fault of the hackle flies themselves, but rather laziness and a self imposed restriction to use flies that I could tie and replace quickly. Now that I have become a better fisherman and lose less flies, I don’t necessarily need to tie two or three dozen flies for me and friends each year. I have also become a more patient fly tier and I find the process of tying soft hackle flies much more enjoyable, so these types of shad flies intrigue me much more than they once did. Only time will tell whether soft hackle flies will take lead over the hair wings but, more and more of them find their way in to my fly boxes each year. At minimum, the Shad Comet is a great alternate pattern and one that I have relied on many times when the fishing got slow. 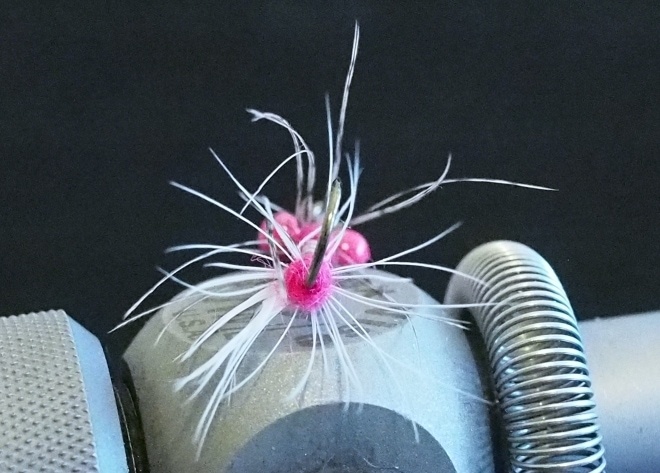 The subtle use of flash and the innate action of the hackle lends itself well to fishing for finicky or spooky fish. 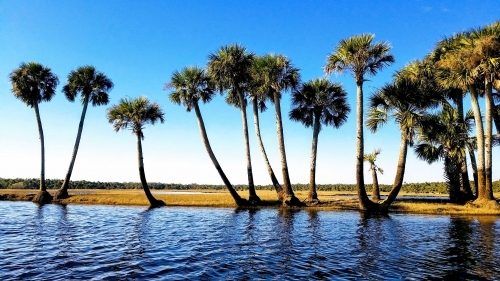 Bright days and shallow water are where I fished them frequently. I have found that this fly does not require much from me to come to life and I typically fish it using a dead drift, and then retrieve it using a slow, smooth figure of eight retrieve. Most strikes come at the end of the dead drift, before starting the retrieve. An interesting note about the Shad Comet fly is, I have caught more gar on this style fly than any other as a bycatch when fishing for shad. I am not sure what gar think they are, but they seem to love them. Catching a good size gar on a 5wt is good fun, trust me! Note: My favorite color combinations are orange hackle/ white tail, orange hackle/ orange tail, pink hackle/ white tail, and pink hackle/ pink tail. While I generally do not carry a lot of chartreuse flies, this is one fly that chartreuse seems to perform as well (or maybe even better on some days) as the other colors, so chartreuse hackle/ white tail, and chartreuse hackle/ chartreuse tail are also recommended. All kidding aside, using two soft hackles on the Shad Intruder really creates a three dimensional profile of a minnow when viewed from the sides, top, or bottom. When viewed from the back, I think it looks remarkably like a small shrimp, which is never a bad thing when targeting shad. The soft hackle barbs add a lot of action to the fly, even when at rest. While even a gentle current brings the fly to life, a strip-strip-pause brings all kinds of action. 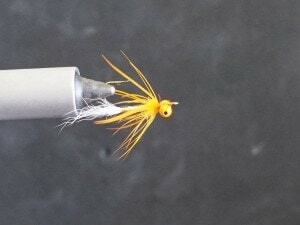 I love soft hackle flies anyway, but I really do believe they are under utilized when targeting shad. I will say that I have had a lot of success with them when the fish seem finicky and unwilling to take a super bright colored fly. Blue bird days in shallow water are great conditions to try this fly, but I have fished them deep on grey days when the shad would not take my standard offerings and had good success as well. 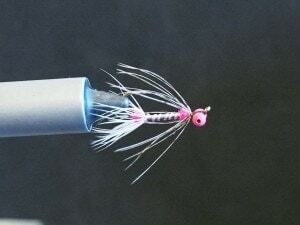 Do yourself a favor, always keep a couple of Soft Hackle Shad Flies and Shad Intruders in your fly box. Doing so has kept the skunk off of me on more than one occasion! 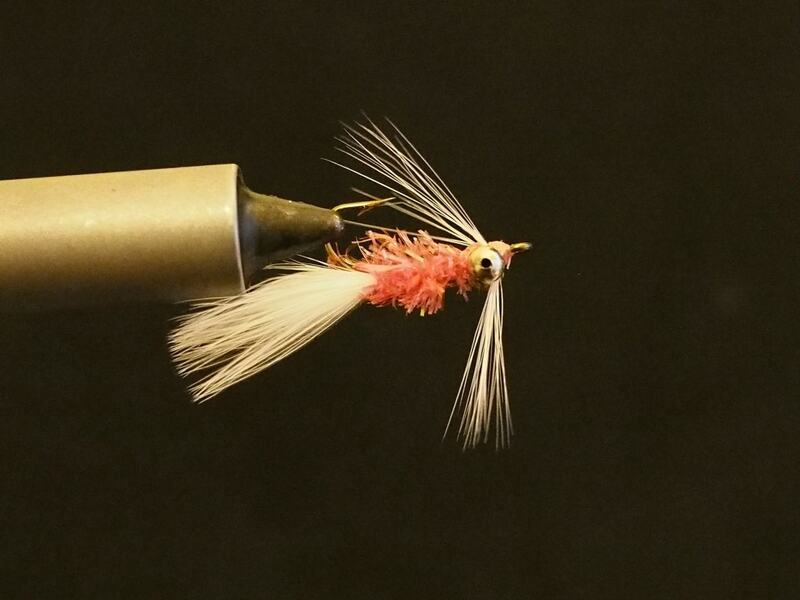 Note: I typically tie this fly with either pink tinsel and dubbing, or orange tinsel and dubbing, but leave the tail hackle white and the main hackle natural. Orange is my favorite color in this pattern, with pink being the alternate.